"These great tasting potatoes can be grilled or baked, your choice!" Heat a barbeque to a high heat, or preheat oven to 400 degrees F (200 degrees C). In a 9x13 inch baking dish combine olive oil, vinegar, garlic salt, rosemary, and ground black pepper. 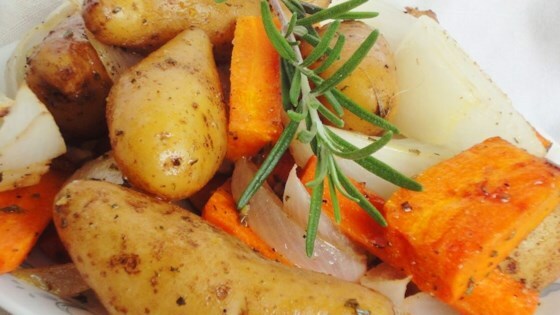 Place carrots, potatoes, and onions into the dish and toss to coat. Bake or grill, turning occasionally, until tender (approximately 40 minutes). This was alright. I wan't crazy about it, but my husband was!! Delicious! I cut the oil to 1 1/2 T. I added to the balsamic vinegar; an additional 1/2 T. Simple to prepare. Will make again. I didn't have any carrots onhand, so I made this without. A pretty good side dish.